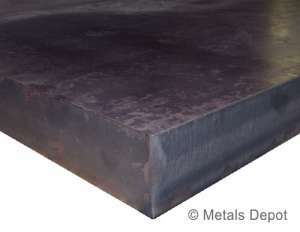 MetalsDepot® - AR400 Plate | Abrasive Resistant Plate - Buy Online! AR400 F Steel Plate is formable grade of Abrasive Resistance Steel Plate designed to accomodate applications where a life of wear is the primary cause for failure among other grades of steel plate. AR400 abrasive resistance steel plate is intended for higher, impact, wear applications where cold-bending and very good weldability is important. Applications for AR400 include dump body liners, hoppers, crushers, feeders, cutting edges, equipment buckets, etc. 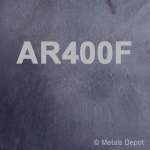 Metals Depot stocks an wide range of thicknesses of AR 400 that can be purchased online in just the size you need. Give Us a call for additonal thicknesses, sizes and custom shapes. Elongation = 23% in 2"
Stock Sizes may vary +/- 1/4"
Cut to Size Lengths +1/8" / - 0"
Select ... 1 x 5 Ft. 2 x 5 Ft. 5 x 5 Ft. 5 x 10 Ft. Select ... 2 x 2 Ft. 2 x 4 Ft. 4 x 4 Ft. 4 x 8 Ft.